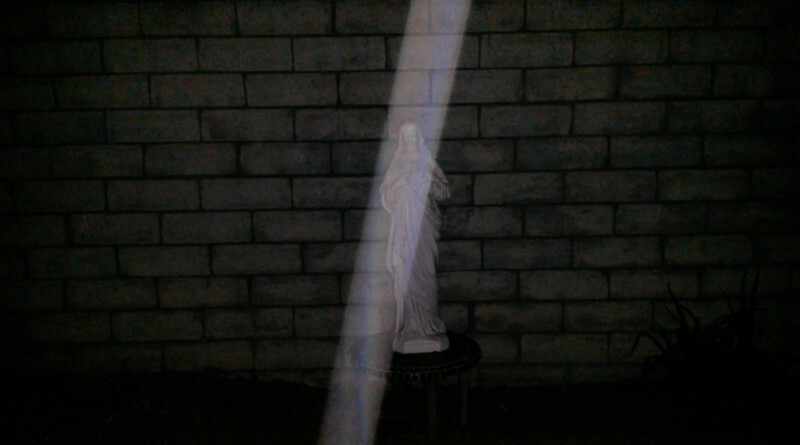 This still image, of the stunning Light of Archangel Michael descending over my Jesus statue, was captured on video the evening of September 10, 2016. I placed this image as the second image so you can compare his Light in this image to the first image in this gallery. Can you see the similarities in color... a soft blue/purple hue...and a strong, straight edged form? The Light body of Archangel Michael is very consistent, so he is unmistakable. Further in this gallery, I have put several more images of Michael, side by side, so you can again see the consistency of his Light. This 3 foot Jesus statue was a 2015 Christmas present from my brother and the Angels love to be photographed with Jesus.